There are so many ways to use chicken. I often serve stir-fried chicken slices with my Beans In Tomato Sauce - making it a meal that will satisfy both carnivores and vegetarians! 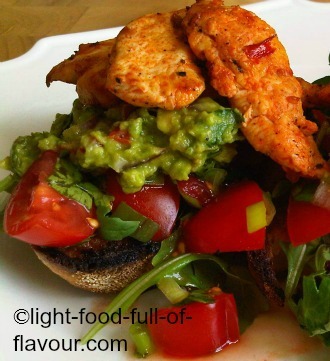 Don't miss my absolutely gorgeous Warm Chicken Salad - a salad that I eat with fried tomatoes on sourdough bread. 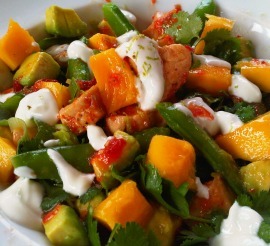 Easy to make, massively tasty and healthy as well. 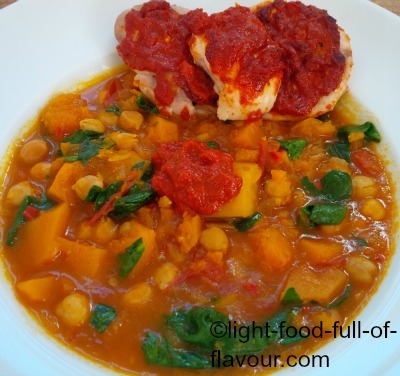 Chicken with harissa and sweet potato tagine is a full-flavoured stunner of a dish. 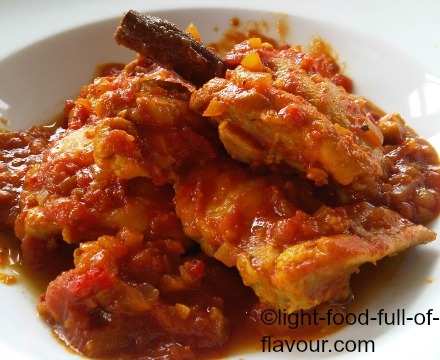 It is a perfect meal to serve to both meat-eaters and vegetarians as the chicken is cooked separately. What a winner! 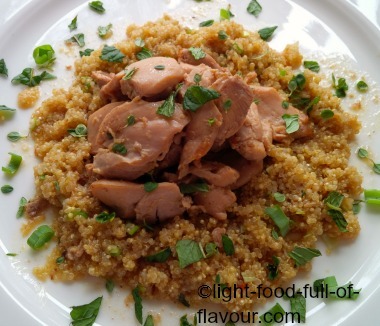 This Moroccan-style chicken dish is bursting with near-intoxicating flavours and yet it's light and low in calories. 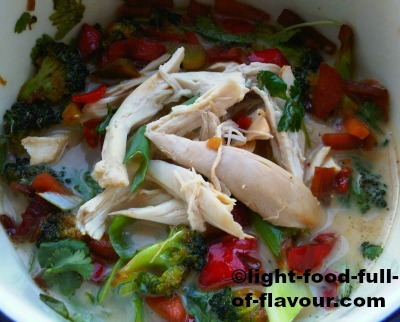 A marinated, delicious chicken stir-fry. 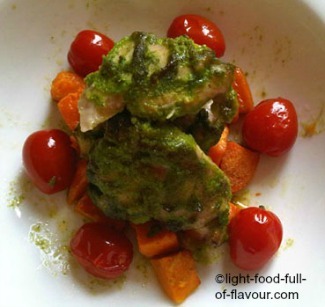 This festive tarragon chicken dish is simply divine - a real crowd pleaser that will have your guests begging for more. 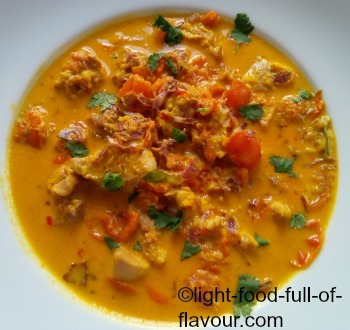 A colourful and flavoursome chicken curry with lemongrass and tomatoes - a curry which is both tasty and healthy. 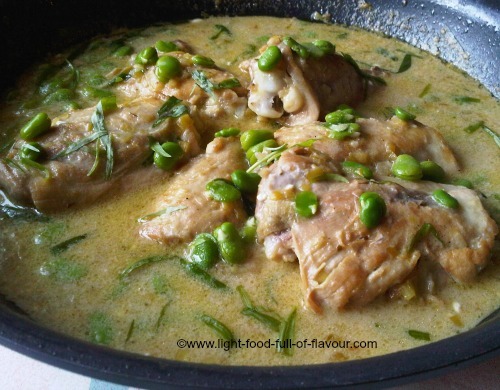 A full-flavoured and low-calorie chicken and broad beans casserole. 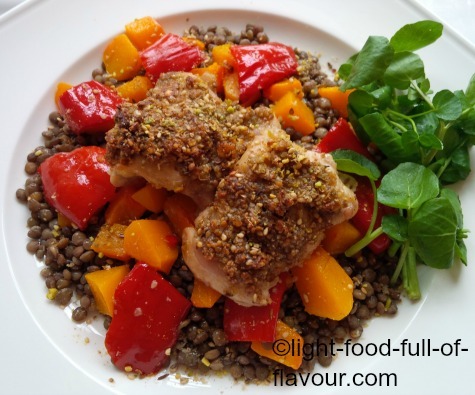 A chicken dish with inspiration from the Middle East - dukkah-marinated chicken with lentils and oven-roasted squash and peppers, topped with feta cheese. If ever there was a meal worth spending time on, this is it. 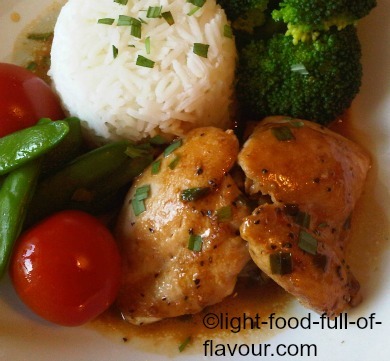 This fragrant poached chicken dish is super-tasty. It’s also really light and fresh. 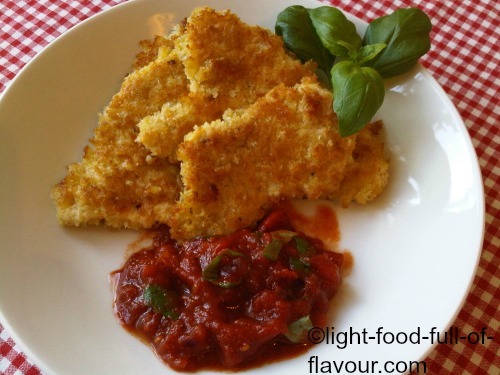 Super-moist and utterly delicious Parmesan breaded chicken served with a tomato-basil sauce and either oven-roasted vegetables or pasta. 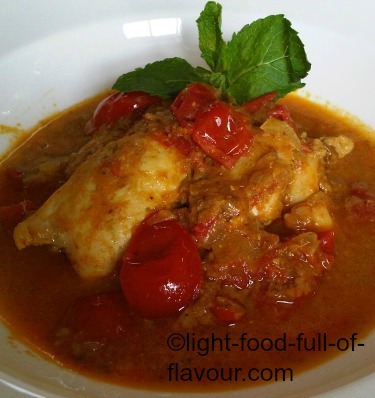 A full-flavoured, low-calorie saffron chicken casserole which is relatively quick to make. 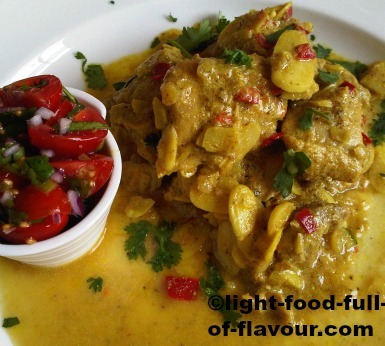 A delicious chicken curry with a creamy but light sauce and almonds. 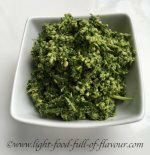 A light and mega-tasty dish which is quick and easy to make - perfect for when you haven't got the time or energy to cook a lot. 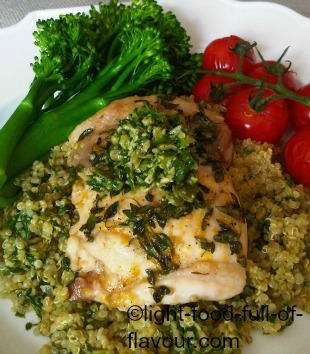 Delicious lemon and garlic chicken served with quinoa mixed with a super-fresh and utterly tasty mint and parsley pesto. 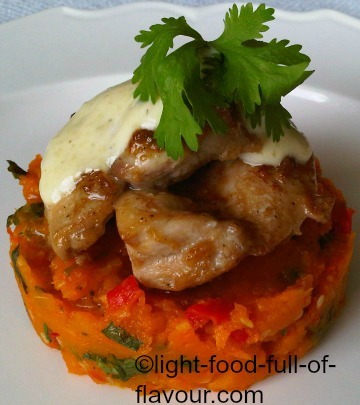 A sensationally delicious and healthy take on a chicken burger with wasabi mayo and mashed chilli and butternut squash. 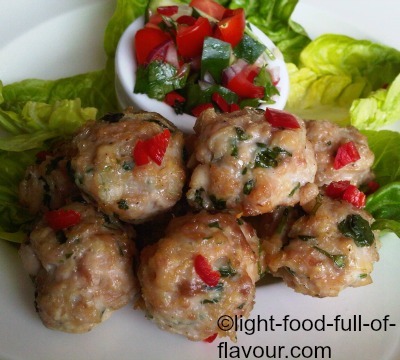 Utterly moreish Vietnamese chicken meatballs served with a cucumber, tomato and chilli salad. 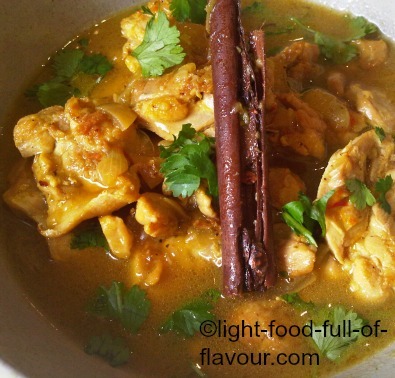 A flavoursome, low-calorie Japanese-style chicken curry with miso. 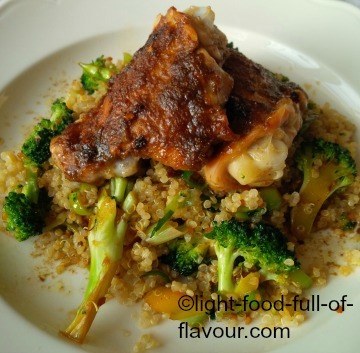 Delicious spicy pomegranate-marinated chicken thighs served with quinoa and stir-fried vegetables. 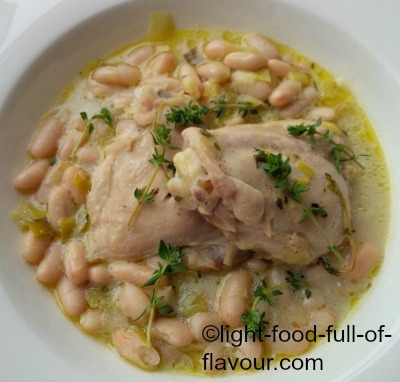 An easy to make and really delicious chicken and bean casserole, which is low in calories. 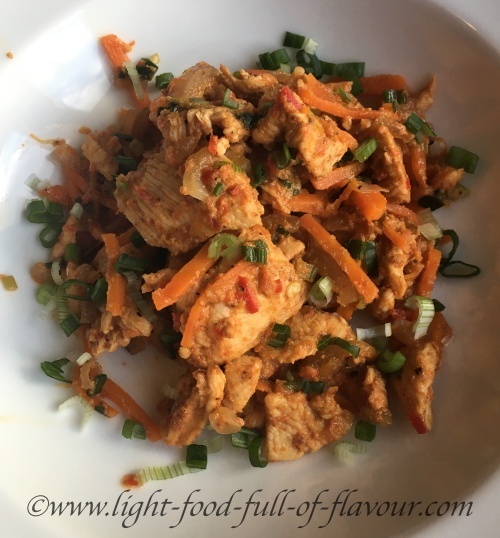 An absolutely divine ginger and soy chicken dish which can be served with citrus and herb quinoa or soba noodles. 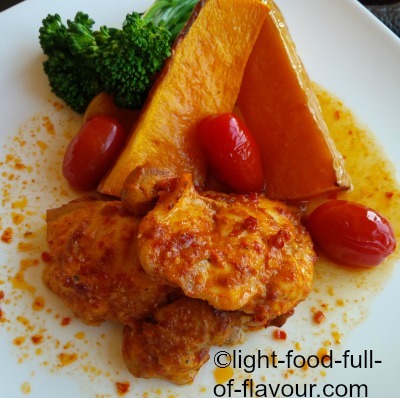 A full-flavoured piri-piri chicken dish which is low in fat and served with tasty oven-roasted vegetables.